Rural Americans are more likely than people in urban and suburban areas to say access to good doctors and hospitals is a major problem in their community. Nearly a quarter (23%) of Americans in rural areas say this, compared with 18% of urbanites and 9% of suburbanites, according to a Pew Research Center survey conducted earlier this year. One factor that may contribute to this view is that getting to a hospital is a longer trip – both in distance and time – for people in rural areas than those in suburbs and cities. Rural Americans live an average of 10.5 miles from the nearest hospital, compared with 5.6 miles for people in suburban areas and 4.4 for those in urban areas, according to a new Center analysis. Taking local traffic patterns into account, that works out to a travel time of 17 minutes for people who live in rural communities, 12 minutes for those in suburban areas and 10 minutes for those in urban areas. These findings come amid a wave of rural hospital closures in recent years that have raised concerns about access to health care. A report by the U.S. Government Accountability Office earlier this year found that 64 rural hospitals closed between 2013 and 2017, more than twice the number of rural hospital closures in the previous five-year period. Overall, 18% of Americans live more than 10 miles away from their nearest hospital, while 24% live between 5 and 10 miles away and 58% live less than 5 miles away, according to the analysis. These figures reflect the fact that far more Americans live in suburban and urban areas than in rural ones. While rural Americans live slightly farther from the nearest hospital and have a slightly longer travel time when compared with suburban and urban Americans, the overall averages mask considerable variation in access within community types – especially rural areas. 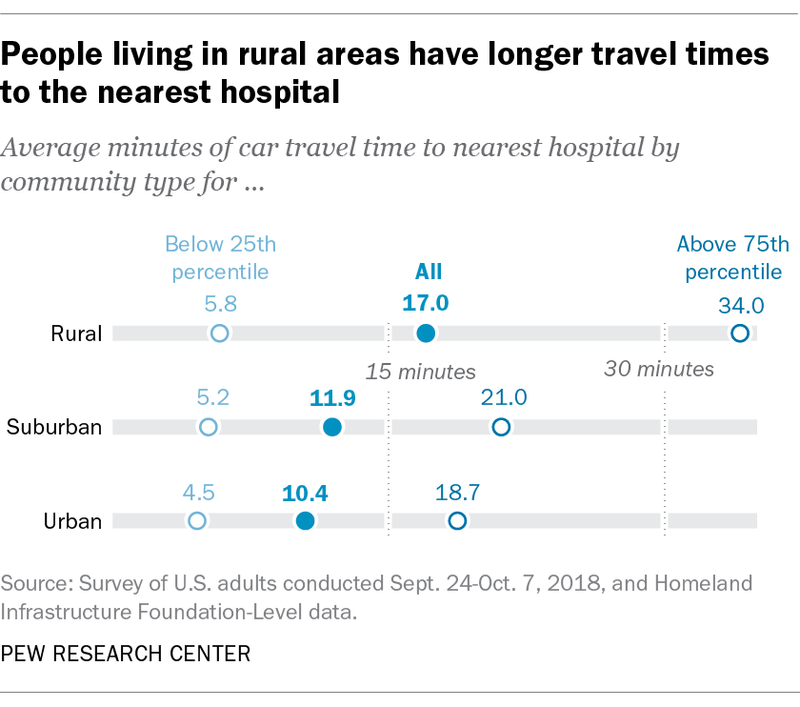 For example, among the quarter of rural Americans whose travel time is the longest, it takes an average of 34 minutes to get to the nearest acute care facility, compared with just six minutes for the quarter of rural Americans whose travel time is the shortest. The discrepancy is smaller among urban Americans: It takes an average of 19 minutes for the quarter of urbanites who have the longest travel time, compared with five minutes for the quarter of urban Americans on the other end of the spectrum. In other words, while some parts of rural America are especially far from hospital access, other rural Americans have similar travel times to the closest hospital as their urban counterparts. In addition to differences by community type, there are also differences by geographic region. 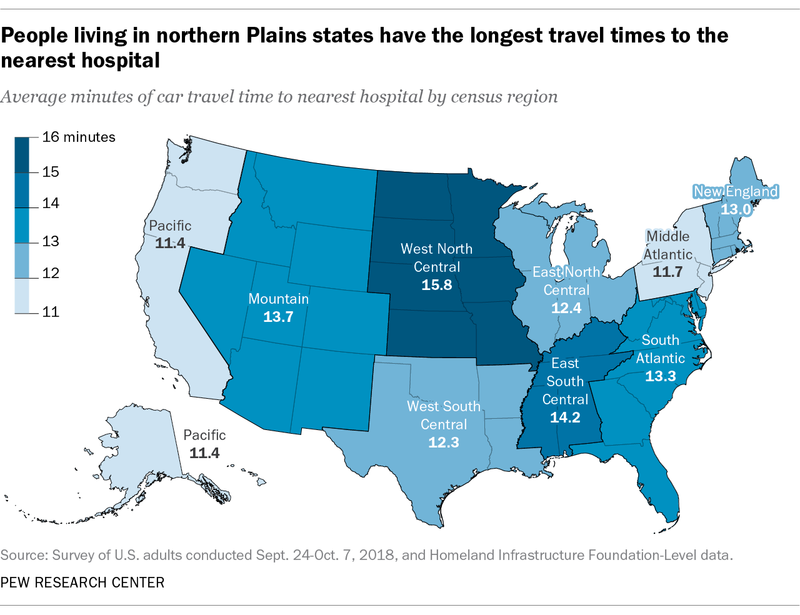 Americans living in the census region known as West North Central (comprised of Kansas, Iowa, Minnesota, North Dakota, South Dakota, Nebraska and Missouri) have an average travel time of 15.8 minutes to the closest hospital. By comparison, people in the Pacific region (comprised of Alaska, California, Hawaii, Oregon and Washington) have the shortest average travel time, at 11.4 minutes. The analysis also examined the kinds of hospitals Americans live closest to. Nationally, two-thirds of Americans (65%) live closest to a nonprofit hospital, but people in rural areas are more likely than those in suburban and urban areas to live closest to a government-run hospital. Around one-in-six rural Americans (17%) live closest to a hospital run by the government. While this is about the same as the share in urban areas (14%), it’s larger than the share in suburban areas (10%) Whether a hospital is nonprofit, for-profit or owned by the government can have implications for the types of services it provides, previous research has found. To conduct this analysis, researchers used the addresses of a random sample of over 10,000 Americans using Pew Research Center’s nationally representative American Trends Panel. They then calculated the linear distance between the respondent’s address and the hospitals, using hospital locations listed in a database known as Homeland Infrastructure Foundation-Level Data. The dataset contains a total of 7,570 hospitals, including 4,511 that are classified as “general acute care” hospitals, which are the focus of this analysis. (Other categories include long-term care, psychiatric and children’s hospitals.) After identifying the closest hospital by linear distance, researchers used the Google Maps API to calculate the travel time and distance to the nearest general acute care facility. Note: The full methodology can be found here (PDF). Onyi Lam is a computational social scientist focusing on data science at Pew Research Center. Brian Broderick is a data science engineer at Pew Research Center. Skye Toor is a data science assistant focusing on internet and technology at Pew Research Center. Family life is changing in different ways across urban, suburban and rural communities in the U.S.